The HangUps 30-inch Large Storage Cabinet offers versatility for your ever changing storage needs in the garage, laundry room, office or workshop. This cabinet mounts securely to the wall with a heavy duty metal rail and hook system. The wall mounted feature ensures easy cleaning beneath the cabinets and protects your stored items from water and dirt. The HangUps Collection is constructed using laminated composite wood and features metal handles and adjustable hinges. This product ships ready-to-assemble and includes all hanging rails and fastening bolts. Store and secure flammable bottles and liquids with the Edsal Steel Flammable Liquid Safety Storage Cabinet. The freestanding cabinet can fit easily underneath your fume hoods, windows or countertops for convenient, out-of-the-way storage. Featuring one galvanized shelf and sturdy double doors, it holds up to 500 lbs. and is clearly marked for easy visibility and added safety. Simply and stylishly organize up to 36 pairs of shoes with the Space-Saving Shoe Storage Cabinet by Prepac. Fit one cabinet in a narrow entryway or combine multiple pieces from the Space-Saving collection in a large mudroom to create a custom closet look at the fraction of the cost. This shoe organizer has 36 spacious cubbies that can be used to store shoes, hats, scarves, keys, mail and any other clutter that needs organizing. The Elite 32 inch Base Cabinet is the perfect addition to your laundry room, workshop or garage. The 1 inch thick grey melamine countertop provides a durable work surface that will last through all your projects. With one adjustable shelf, this cabinet will accommodate anything you need to store in it. Combine it with other pieces in the Elite Collection for a customized workspace. Constructed from non-toxic, laminated composite woods with a sturdy MDF backer. Ships Ready to Assemble, includes an instruction booklet for easy assembly and has a 5-year manufacturer's limited warranty on parts. Manufactured in Canada and meets all North American safety standards. HangUps 30 Inch Large Storage Cabinet The HangUps 30-inch Large Storage Cabinet offers versatility for your ever changing storage needs in the garage, laundry room, office or workshop. 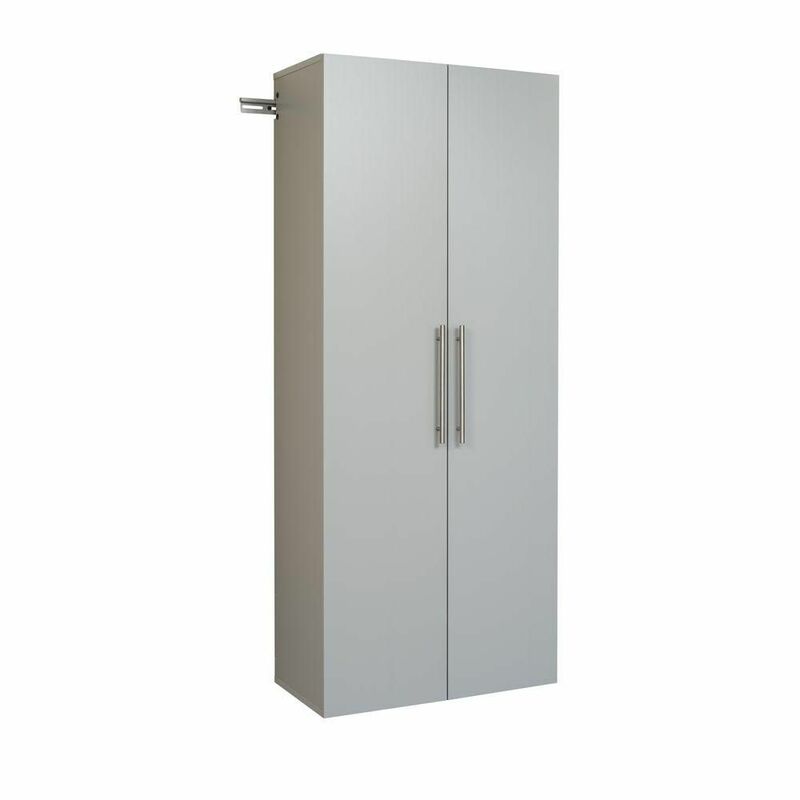 This cabinet mounts securely to the wall with a heavy duty metal rail and hook system. The wall mounted feature ensures easy cleaning beneath the cabinets and protects your stored items from water and dirt. The HangUps Collection is constructed using laminated composite wood and features metal handles and adjustable hinges. This product ships ready-to-assemble and includes all hanging rails and fastening bolts. HangUps 30 Inch Large Storage Cabinet is rated 4.5 out of 5 by 6. Rated 5 out of 5 by Zady from Love the final products. Its was very easy to put... Love the final products. Its was very easy to put together with help. It looks great in my garage. Rated 4 out of 5 by Don from Sturdy material, strong shelving, good instructions. Mounting rail provides flexibility in hangi... Sturdy material, strong shelving, good instructions. Mounting rail provides flexibility in hanging placement and keeps cabinet off the floor. The only potential issue is the small recessed hex head on the mounting screws. Using an electric drill to drive the screws it is easy to strip the corners off the hex and end up with a round hole that you can not screw in or out. Rated 5 out of 5 by Karen from The cabinets are lovely. Takes a bit of time to... The cabinets are lovely. Takes a bit of time to put together but all hardware was included. Hang rail system was a but of a challenge but not due to their issue but my studs are where they should be. My neighbor has these so we were able to see them & custom order to fit our needs. Rated 4 out of 5 by Ahess from Damaged door One door was damaged during shipping, the box/container was smashed. We otherwise are pleased with the cabinets and drawers. We may purchase others. What is it made out of? If i am putting it in a narrow area, how much clearance do i need on either side for the track which the cabinet hangs on? The cabinet is made of laminated particlboard. The metal rail is 38&quot; wide - but it can be cut using a hacksaw.